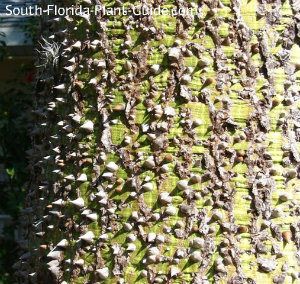 The exotic floss silk tree features showy pink flowers, seed pods filled with fluffy white silk, and one of the most unique tree trunks in nature. This tree has incredible "wow factor" for several reasons. The thick trunk keeps its green color (see close-up below) and takes on a slightly bulbous shape as the plant matures. The trunk also develops amazing thorns like spiky medieval weaponry. Pretty pink flowers cover the treetop in autumn (this photo was taken in mid-November), followed by large, pear-shaped seed pods that contain a silky "floss" embedded with small seeds. The silk was once used to stuff pillows. Best on large properties or as a single specimen in a medium-sized yard, the floss silk should be planted well away from foot traffic and play areas because of the thorns. 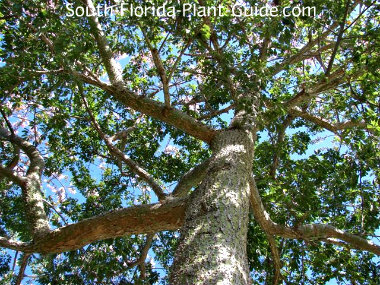 These trees are fast growers when they're young, slowing down to a more moderate pace as they mature, with an ultimate height of about 35 or 40 feet tall. 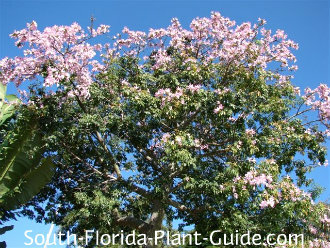 Cold hardy anywhere in South Florida, the tree is deciduous (loses its leaves in winter). But the unusual trunk and irregular branching pattern make it an interesting landscape feature all year round. Place in a full to part sun location. Is it floss silk or silk floss? The former is correct, though mention any combination and people who are familiar with this tree will know what you're talking about. One way to remember the correct name is to think alphabetically: F comes before S.
Add top soil or organic peat humus, mixed with composted cow manure, to the hole when you plant. 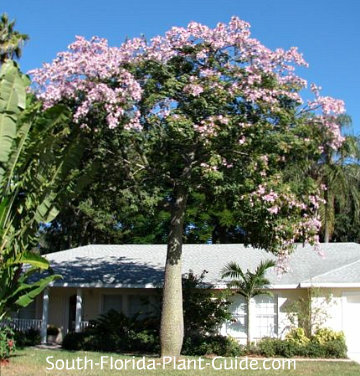 This is a fairly drought-tolerant tree. Water regularly for the first year to get it well-established, then give it more time to dry out between waterings once it's more mature. 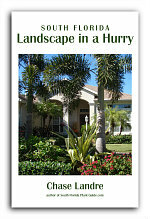 Fertilize 3 times a year (spring, summer and fall) with a good granular fertilizer. Come away from the house 15 feet or more to accommodate the eventual size of the canopy. 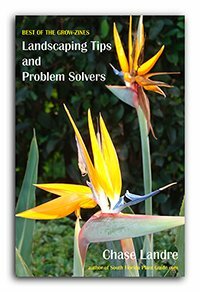 Plant 10 feet from drives or walkways so roots (as well as leaves and flower petals) don't become a problem. This tree can be grown in a large container while it's young. 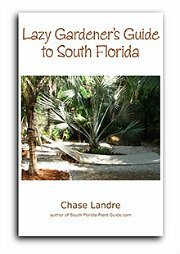 COMPANION PLANT SUGGESTIONS: Use plants around or nearby that like to go a bit dry between waterings, such as selloum philodendron, dwarf oleander, variegated arboricola, muhly grass, burfordii holly, coontie, and ice plant.